High alcohol levels in Pinot Noir is clearly a contentious and polarizing topic. More readers of the PinotFile responded to my recent feature, “Tiptoeing Around the Perception of Alcoholic Warmth in Domestic Pinot Noir,” than any other article I have written in recent memory. Here are some of their comments summarized. Adam Lee, the winemaker at Siduri Wines, who appreciated the opportunity to respond to my article, had a number of issues with my article so I chose to publish his extensive comments and my responses. Answer: Your request for more information is understandable but unreasonable. I would have to go back through thousands of tasting notes to find ones that contained a comment about alcoholic warmth or heat to determine which wines were downgraded as a result and then correlate with the reported ABV. I can tell you with great assurance that the vast majority of wines I have downgraded because of perceived alcoholic heat have had a labelled ABV above 14.5%. I should have included this statement in the article. That is not to say a wine with higher alcohol cannot be balanced. 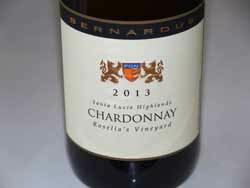 I had a 2013 Aubert Ritchie Chardonnay this week that was 15.1% ABV on label and was impeccably balanced with absolutely no sense of alcoholic warmth. Answer: Your point is well taken. It is obviously a generalization but one that often holds true, especially with high ºBrix levels. Answer: This is a well-cited article in a respected peer reviewed journal. Although the wines were not Pinot Noir, they were red and were closely matched for all physical attributes except for alcohol content. This study only begins to explore the complex relationship between a wine’s characteristics and the consumers’ gustatory and neural responses, and obviously more study needs to be undertaken. I am simply trying to make the reader aware of this study that had intriguing results. Ethanol makes aroma compounds more reticent to leave solution. A 2000 analytic chemistry study by Whiton and Zoecklein showed that as alcohol rose from 11% to 14%, there was a reduced recovery of the typical wine volatile compounds. Answer: I still stand by my statement that the higher the alcohol, the less chance the wine will be balanced and does not contradict my statement that lower alcohol wines can also be unbalanced. However, that former statement may be a bit broad as you point out. Perhaps, I should have stated, “Once the alcohol reaches a significantly high level, say 14.5% and above, there is less chance the wine will be judged as balanced because of alcohol perception.” And yes, a Pinot Noir with too little alcohol can be unbalanced, but not usually because of alcohol perception. Answer: Refer to the references on Brettanomyces above as justification for my statement. Low grape acidity and higher sugars create a milieu that can predispose to microbial contamination, but are not the major causes of Brettanomyces and VA as you point out. 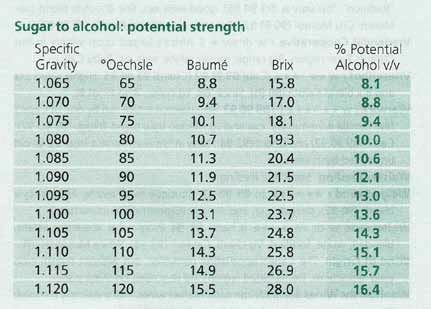 Answer: The sugar to alcohol potential strength was obtained from the following chart. The chart relates the three principal systems for measuring the sugar content of grapes (German, French and American) to each other, to specific gravity, and the potential alcohol of the wine if all the sugar is fermented. The chart was in my files and taken from a reference book, but I have misplaced the exact source. ºBrix to alcohol conversion is as follows as you know: for every gram of sugar that is converted during fermentation, about half a gram of alcohol is produced. The alcohol conversion factor can be between 0.55 to 0.64, so the conversion factors in this chart are reasonable. I was simply trying to give the reader some idea of how ºBrix relates to potential alcohol and not meant to imply these conversions are absolute. Perhaps I should have given estimated conversion ranges rather than exact predictions. Actual conversion ratios are subject to variability depending on yeast properties and fermentation conditions, so the final alcohol may be higher or lower than the estimate. In addition, more accurate conversion ranges can be determined using glucose plus fructose (potential alcohol = glucose + fructose g/L / 16.83) rather than ºBrix, but this leads to a rather technical discussion unsuitable for much of my readership that is simply trying to relate ºBrix, a term they are familiar with as an indicator for maturity of the grape, to final alcohol (ethanol) percentage. Referencing the cited article in the Journal of Wine Economics, I was quoting the authors who stated, “Since sugar converts essentially directly to alcohol, a 9 percent increase in the average sugar content of wine grapes implies a corresponding 9 percent increase in the average alcohol content of wine (over 28 years).” The authors are making a general assumption which is fair enough in the context of their discussion, although strictly speaking, as you point out, conversion ratios vary with different levels of ºBrix. There have been a number of reputable reports showing a parallel escalation of alcohol content of wine and increase in average sugar content of wine grapes. One of these studies in California showed that the average alcohol levels in wine rose from 12.7% in 1971 to 14.8% in 2001 (an increase of 16.5%), as the average level of ºBrix at harvest rose from 20.5 in 1971 to 24.2 in 2001 (an increase of 18%). Answer: I agree with your comments. However, it is well known that different strains of currently used yeast have different levels of attenuation, so they will all convert different percentages of sugar to alcohol. No reason to think that at some point yeasts will potentially be isolated and commercially used that preserve flavor at lower alcohol levels (see also Scott Flora’s comment above). Answer: The authors of the article in the Journal of Wine Economics were only expressing an opinion, “was thought to result from,” although it could be interpreted as bias. That said, can you give my a better reason why label claims systematically understated the alcohol content of California wine? Why do a number of Pinot Noir producers put 14.1% ABV on the labels of practically every one of their wines when it is highly unlikely every wine was bottled at 14.1% ABV? Is it simply they just don’t want to be bothered getting it right? I admit that climate is only one factor in interpreting my data, and broad statements like “Santa Lucia Highlands is one of the warmer growing climates” serves no verifiable purpose. 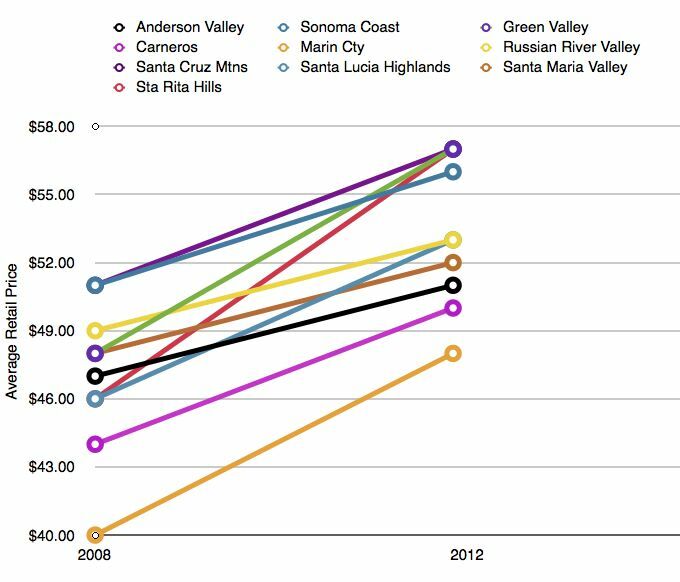 As John Haeger points out in his reference book, North American Pinot Noir, “It is surprisingly difficult to collect genuinely comparable data about the main regions in which North America’s Pinot Noir is grown.” In his excellent discussion of climate data of Pinot Noir growing regions, he fails to mention the Santa Lucia Highlands specifically. A comprehensive and comparable climate study on the various domestic Pinot Noir growing regions would be valuable, but would be a monumental and complex undertaking. It could be argued ad nauseam which Pinot Noir growing regions are the “coolest.” What I was attempting to reveal in my study was the average ABV by vintage of 9 California major Pinot Noir growing regions for the wines I tasted. For whatever reason, be it climate, length of growing season, timing of harvest, soils, vine age, predominant clones, or undoubtedly a myriad of other factors, the data still indicates that in every vintage studied, the average ABV was highest in Pinot Noir from the Santa Lucia Highlands. It’s the dog days of summer and brutally hot and humid. I am reaching for an ice cold craft beer these days and leaving the Pinot Noir in the cellar. Most all the reviewed wines that follow were sampled before the recent heat set in. 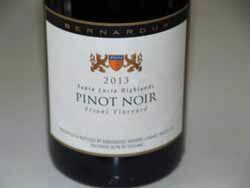 The 2013 Pinot Noirs are highly endowed with well-ripened, but not surmaturité fruit, and resulting high alcohol levels. The wines are appealing for their upfront fruitiness, but at these high alcohol levels, the wines all taste relatively similar. It is a difficult balancing act to harmonize the fruit load, high alcohol, considerable new oak, robust fruit tannins, and lower acidity, but success was achieved in some of the wines. 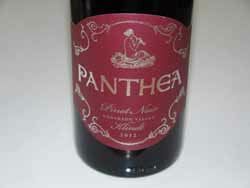 Panthea is located in Philo, in the “deep end” of the Anderson Valley. 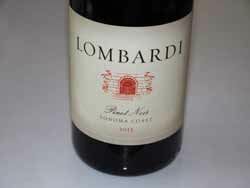 The meticulously farmed estate vineyard is steeply planted to California heritage clone Pommard and a small amount of Dijon clones in shallow and rocky soil creating low yields. Owner and vintner Kelly Boss has a background in farming who developed his winemaking skills through classes at University of California at Davis and Sonoma State University. His hand’s-on training came working with Dan Sokolow of Raye’s Hill Vineyard & Winery. This is a true family affair with no front office or year-round staff. The wines are sold through a mailing list. 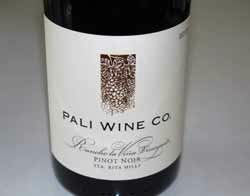 Visit www.pantheawine.com. The following reviewed wines are scheduled to be released in the fall. There are some changes in the wines from previous vintages. The Carneros Estate Vineyard Pinot Noir continues to be sourced from the Donum Ranch, but has been re-named “Lawler Vineyard,” after the road leading to the ranch, to emphasize that it comes from a single vineyard. In 2013, a Winside Vineyard Pinot Noir is offered from the Estate vineyard previously known as Nugent Vineyard in the Russian River Valley. The Carneros Pinot Noir is sourced from multiple vineyards throughout Carneros, and is offered mainly to on-premise accounts. 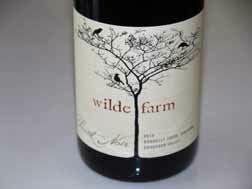 There are 3 new wines in 2013: (1) the Sonoma Coast Pinot Noir that is a blend of Russian River Valley and Carneros ranches and offered at a value-driven price point; (2) Ferguson Cuttings, which is sourced from vines on the Donum Ranch grafted to cuttings from the Ferguson Vineyard; (30) Laura, a reserve wine from Winside Vineyard. 2 wines were produced from the Angel Camp Vineyard in Anderson Valley: (1) Anderson Valley Pinot Noir and (2) “Whole Cluster” Anderson Valley Pinot Noir. The 2013 vintage offered a smaller crop than in 2012 with smaller berries and thicker skins. The result is concentrated wines with notable tannins, but the tannins are ripe and not hard or edgy. All wines have been aged over a year in bottle before release. There is an impressive consistency here in quality and nearly all of these offerings would be highly enjoyable at the dinner table. Mary Elke, who owns and farms Donnelly Creek Vineyard, told me that she grows two clones that she doesn!t think anyone else in Anderson Valley has planted. In 1990, she started Donnelly Creek Vineyard on a site of abandoned pear and apple orchards. She obtained a planting lend from American AgCredit after securing a long-term contract with Mumm Napa for the grapes which would begin production in year four. As a result, initially she was looking for Pinot Noir and Chardonnay clones that were known to be higher yielding and suitable for sparkling wine. Mary and her spouse had been growing grapes since 1978 in what is now known as the Coombsville AVA of Napa Valley. In their vineyard, they had 4 acres of “Elliott” Pinot Noir clone for still wine that they sold to Mondavi Winery. They were told that this clone was the old “Beringer clone” from the 1960s. The Elkes called it “Elliott” because they got the budwood from a vineyard on Big Ranch Road in Napa owned by the Elliott family. They took budwood from their Napa vineyard to Anderson Valley and field-budded about 6 acres. By 1995, the Elkes were experimenting with small lots of these two clones for still wine under the Elke label. Since site trumps clone, they found that while they had selected the clones for sparkling wine, when grown in Anderson Valley they produced beautiful still wines. Then in 1998, the Elkes added some Pommard 5 to their Pinot Noir that they had planted in 1995. The Elliott clone usually ripens early, is slightly lighter in color, and has great cedar spice notes. 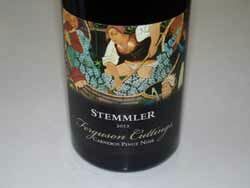 The Stang clone provides structure to the wine and notes of blueberry and raspberry. FEL, Saintsbury and Elke have all used the Stang clone in their Donnelly vineyard designate wines. Elke Donnelly Vineyard Pinot Noir is 25% Elliott, 25% Stang and 50% Pommard 5. Wine & Spirits Top 100 Tasting Event: Tuesday, October 20, 6:30 p.m.-8:30 p.m., city View at METREON, San Francisco. Tickets on sale September 20 @ www.wineandspiritsmagazine.com/top100. Fort Ross-Seaview Harvest Festival: October 17, Fort Ross State Historic Park, Jenner. Food trucks, music, tasting of wines from members of Fort Ross-Seaview Winegrowers Association. Optional Grand Lunch prepared by local chefs. Details and tickets @ www.fortross.org. Pinot on the River: October 25, Healdsburg. 100 wineries, artisan food vendors, outdoors at the city’s central Healdsburg Plaza. $75 in advance. Visit www.pinotfestival.com. 6th Annual Russian River Valley “Single Vineyard Night”: More than 30 of Russian River Valley’s wineries will gather for two tasting events in November celebrating vineyard designate wines. The first evening is November 4 at the Golden Gate Club at the Presidio in San Francisco and the second is in Sacramento at Tsakopoulos Library Galleria on November 12. 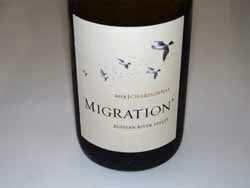 For a list of participating wineries and tickets, visit the Russian River Valley Winegrowers (RRVW) website at www.rrvw.org. Big Sur Food & Wine Festival: November 5-7, details forthcoming. Website is www.bigsurfoodandwine.org. Harvest on the Coast: November 6-8. Grand Tasting and Wine Auction, “Crafted on the Coast” Winemaker Dinner, and “Slider Sunday” at local wineries. Save $20 on tickets when book your stay in Avila Beach. 17th Annual Wine & Food Affair: November 7-8, 11:00 a.m.- 4:00 p.m. each day. A weekend of wine and food pairing at over 100 wineries. $70 for the weekend. Tickets on sale now @ www.wineroad.com. ¡Salud! The Oregon Pinot Noir Auction. Some of Oregon’s foremost wineries debut the 2014 vintage and offer their ¡Salud! Cuvées - collectible Pinot Noirs crafted exclusively for the auction. Cuvée Tasting and Big Board Auction Friday, November 13, at Ponzi Vineyards, and Dinner and Auction Gala Saturday, November 14, at The Allison Inn & Spa. Tickets are now available at www.saludauction.org. Pinot Days Southern California: November 14, Skirball Cultural Center, Los Angeles. Winemaker events at restaurants and wine venues around town preceding the Grand Festival. Trade Tasting 12:00 p.m.- 2:00 p.m., Public tasting 2:00 p.m. - 5:00 p.m., VIP Tasting 12:00 p.m. - 5:00 p.m.. Tickets available @ www.pinotdays.com. September is California Wine Month. There are many other events scheduled. For a complete listing by region of all the activities go to www.discovercaliforniawines.com. The Drinkers Guide to Healthy Living, Gerald Facciani. A sober assessment of the benefits and dangers of drinking. 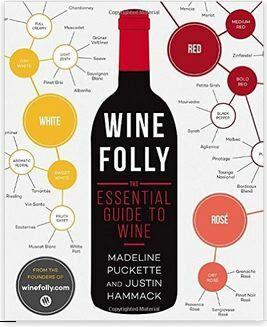 Wine Folly: The Essential Guide to Wine, Madeline Puckette and Justin Hammack. From the creators of WineFolly.com, this is a unique infographic wine book. Highly recommended. Long Meadow Ranch Buys Corby Vineyard Napa-based Long Meadow Ranch has bought 145 acres in Anderson Valley owned by the Corby family that includes 69 acres of vineyards. The wines from this property will be crafted by Stephane Vivier, who comes for HDV in Carneros where he was the winemaker for more than 10 years. Oeno™ Vaults This wine cellaring company is located in Sonoma County and is a unique off site facility. The company will pick up your wine from any area winery in a refrigerated truck and take it to the wine storage facility. Your inventory is available online or through a mobile app. The wines are stored in an armed, climate controlled private vault with 24 hour surveillance and climate monitoring. Wines can be shipped at your convenience from your vault throughout the United States on demand. For more information, visit www.oenovaults.com. Gallo Acquires Talbott Vineyards in Monterey E. & J. Gallo has acquired Talbott Vineyards, one of California’s largest estate grown wine producers. 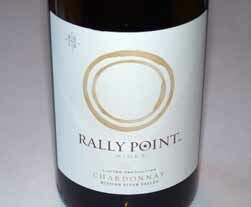 The winery was founded in 1982 by Rob Talbott and specializes in Pinot Noir and Chardonnay. The purchase will include the Sleepy Hollow Vineyard. 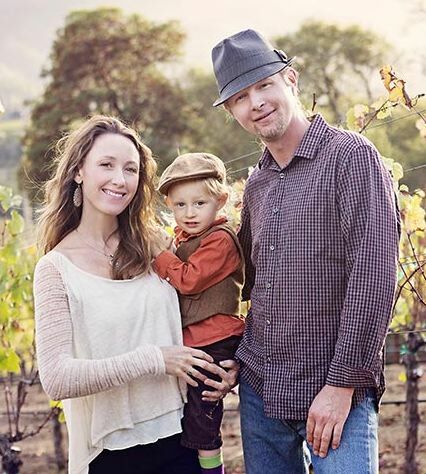 IPOB Announces 2016 New Winery Members There are five new members of In Pursuit of Balance, including Mignanelli Winery, Poe Wines, Presqu’ile Winery, Small Vines Wines and Thomas Fogarty Winery. Membership in IPOB is determined by a committee of wine professionals based upon a blind tasting. Membership is valid for two years and every two years each winery must resubmit to continue their membership. IPOB 2016 event schedule coming soon. Visit www.inpursuitofbalance.com. Wine Magically Appears Free! View video: http://www.flixxy.com/americas-got-talent-winner-matfranco- returns-with-new-magic-trick.htm. 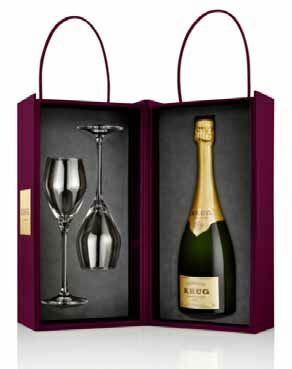 Krug Champagne for the Holidays Krug is offering the Krug Sharing Set, a special gift box for the Champagne lover. Each customizable dark cherry box includes two specially designed “Joseph” crystal glasses by Riedel, named after the House’s visionary founder, along with a bottle of Krug Grande Cuvée. The Krug Sharing Set will be available nationally in November for $220. The unique story behind each individual bottle can be discovered by entering the Krug ID, a six digit number on the back label on the Krug app or Krug.com. BigMouth Inc. Novelty Wine Products The Ultimate Wine Bottle Glass holds a full bottle of wine and The World's Largest Wine Glass holds up to three bottles of wine. A musical corkscrew plays the song "O'Sol Mio" while opening up your favorite wine. Tipsy Wine Glasses are made with slightly bent stems so they appear to lean. BigMouth Inc. products are fun gifts that are available in nationwide retailers including Walmart, Target and online at Amazon.com. The catalog is online at www.bigmouthinc.com/CATALOG-VIEW. Strict vegans can find it challenging to determine which wines are vegan since the wine’s label will not always provide the information that qualifies where or not the wine in the bottle is vegan. Many wines are “fined,” meaning animal-based products such as albumin (egg whites) or isinglass (a fish byproduct) are used to clarify wine. Although these animal-derived products are removed before a wine is bottled, the wine might not be considered strictly vegan. Some wines are also filtered through animal byproducts before bottling. 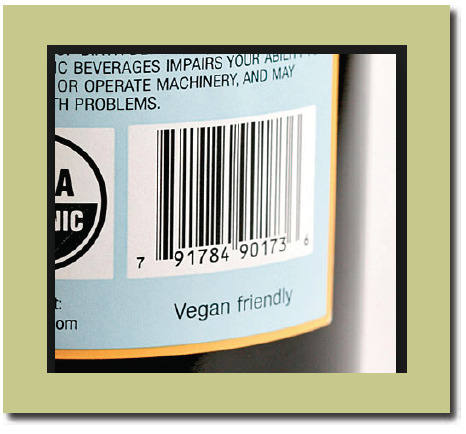 Current labeling laws do not require a listing of animal-derived products used in vinification or the admission that the wine is unfined and or unfiltered. Wines that are unfined and unfiltered before bottling are considered vegan. Organic or biodynamic wines may or may not be vegan. A vegan who wants to drink wine should contact the producer of the wine of interest to see if it is vegan. You can also visit the website, www.barnivore.com, for a listing of vegan wines. Another useful resource are the employees at Trader Joe’s markets since they can access a list of all their vegan products, including wine. 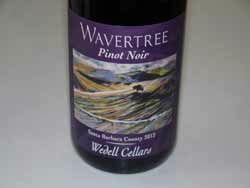 Many small production domestic Pinot Noirs are unfined and unfiltered and qualify as vegan. Pinot Noir is a very vegan-friendly wine since it matches with a wide variety of vegetables such as mushrooms, sweet red bell peppers, tomatoes, red beets, carrots, caramelized onions as well as fruits such as black cherries, figs, blueberries, raspberries, cranberries, plums and currants. Pinot Noir particularly shines with Asian flavors such as hoison, seaweed, fennel, sesame oil, and mild teriyaki.